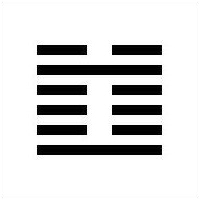 The first two hexagrams of the I Ching are each comprised of lines of only one type–six solid lines in the first hexagram, symbolizing yang and heaven and six broken lines in the second hexagram, symbolizing yin and earth. Here, in the third hexagram, we come to the first scenario that involves a combination of the two forces. We are asked to contemplate a blade of grass that is still beneath the ground. Growing upward, it pushes against an obstruction that stands between itself and the freedom and sunlight and open air that comprise the blade’s destiny above ground. Finding oneself in the position described here feels extremely unpleasant–like being caught in a sudden, violent, and chaotic thunderstorm, rain and lightning crashing down all around us. At the same time, the lesson we are taught involves the flip side of thunder, lightning, and rain–that they serve, quite literally, to clear the air of both tension and dust, allowing us to move forward in clarity. Growth will always be both difficult and painful, but this difficulty and pain will always lead to clarity and increase. Going through the six lines, we are presented with six different possible manifestations of difficulty “at the beginning” and how we can wisely respond to them. First, we find ourselves at the beginning of some enterprise and we, as promised, encounter an obstacle. We are shown that now is not the time to give up, because we are solid in the knowledge that we seek what is right. What is required of us here is a pause, a pause to ponder all aspects of the scenario and to find helpers to become allies for our cause. Now is not the time to go at this alone, and we are reminded that we can only succeed in recruiting others if our approach remains humble and sincere. Secondly, we see a violent explosion. There are difficulties and problems assailing us from every possible direction. I think it’s safe to say we all know this feeling. In the midst of all of this, we are approached by someone (or something) we assume to be essentially a thief looking to rob us, but we’re wrong. This person is looking to help us, which is good. At the same time, we can’t take help from just anyone, even in such dire circumstances. The problem is that, eventually, things really are going to settle down. Making a deal with the wrong person (or the devil, so to speak) will tie our hands and restrict our movements later on. The picture we are given here is that of a lover who is separated for a very long time from her partner but remains true during the interim and is not distracted, knowing that a reunion is eventually inevitable. Note that this knowledge is born out of an understanding that all things transpire in cycles, and not merely in a hopeful faith, blind or otherwise. Thirdly, we are often tempted to escape an unpleasant reality by surging forward with action and effort. If we do so at the wrong time or at the wrong place, or before we receive the guidance and knowledge that we need, we run headlong into sheer disaster. Remember, friends, you can’t cheat fate. You can’t cheat the cycle. There is no free lunch. Fourth, we reach a juncture at which we are finally called to action, but we lack the power to do so. Under such conditions, look for a networking opportunity to coming our way and grab it when it arrives. Here, we need to make connections in order to get the job done. It’s not always (or ever) easy to acknowledge our own lack of individual sovereignty, but success in painful growth requires us to get past that and do what needs to be done. Fifth, we are reminded most unpleasantly that there are times in which we just can’t win. When our best intentions are distorted and thwarted by powerful external forces (sounds like every day, doesn’t it? ), and we try to force the execution of a great project anyway, it will never work. Here, we are shown that we can’t succeed in a grand sense without the support and confidence of the public at large. Instead, we must continue working hard and quietly, waiting for the day when the external storm will clear–which it will. Lastly, we are shown what is described as “the saddest of all things”–the picture of people who are never able to overcome the difficulties at the beginning, the blade of grass who encounters that last obstruction before open air and gets permanently stuck. There is no good answer here, no real way out–if the difficulties at the beginning prove to be too much for us, we’ll get stuck and just give up. That, truly, is tragedy. Interesting piece of wisdom to ponder: in the chaos of any beginning, the order of the end is already implicit. If we learn to use the right kind of eyes, we’ll learn to discern this specifically. Until that day, we can hold the knowledge close in times of difficult growth. If future order is always contained within present chaos, perhaps we might fear it less. In the meantime, the I Ching provides us with some very basic general advice to hold us over–if we know the fate that lies ahead while the present remains murky, hold back and exercise caution for the moment. Don’t withdraw into seclusion, but instead seek helpers and allies. We need them–and they need us, too; we are reminded that with all that we have to offer, it’s a shame for us to try and remain idly above the fray.